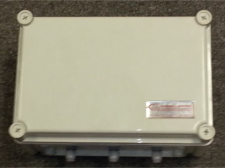 We offer a range of enclosures of various sizes to accommodate our telemetry products. 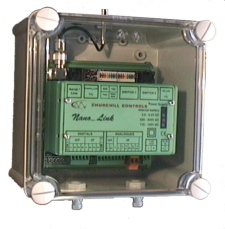 All enclosures include DIN rail for mounting modules and glands in the bottom for cable entry. Enclosures for systems that communicate by radio include bulkhead extension leads that provide a TNC jack on the top and a flying lead terminated in a TNC plug for connection to the relevant module. Alternatively the telemetry modules can be fitted on DIN rails fitted in third party control panels or enclosures. In these cases we can supply longer bulkhead extension leads if required to extend the aerial connection to the top of the enclosure. This measures 190 x 190 x 130 mm and provides a compact housing for any of our modules. If used with Micro_Link or Nano_Link there is also space for a lightning protection unit or a solar regulator. It gives protection to IP67 so can be used indoors or outdoors. The illustration shows a transparent lid, but enclosures are normally supplied with opaque lids. 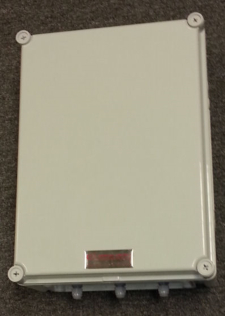 This measures 280 x 190 x 130 mm and provides a housing for any two of our modules. Although it gives protection to IP67 it is not recommended for use outdoors. This measures 280 x 380 x 130 mm. It can house up to 4 Nano_Link or Micro_link modules, or a Mega_Link with up to 5 expansion modules. It gives protection to IP67 and can be used indoors or outdoors. Copyright © 2018 Churchill Controls Ltd. All Rights Reserved.